Welcome to the "SW Neighborhood" located in the historic district near downtown Ardmore, Oklahoma. This beautiful bungalow, built in 1935, boast approximately 1500 sq. ft. with original beautiful hard floors and 10&apos; ceilings. 2 Large Bedrooms, 1-Large Bath, Storage Sheds, Detached Single garage and fenced in back yard. Some impressive updates to mention: New Vinyl Windows, Large Front Porch with Trex Decking, Driveway/Sidewalk replaced in 2009, A 25 Yr. Roof/Decking replaced in 2013, Insulation (Cellulose) 2013, Central Heat/Air 2004, Electrical updates include a new Panel in 2004. 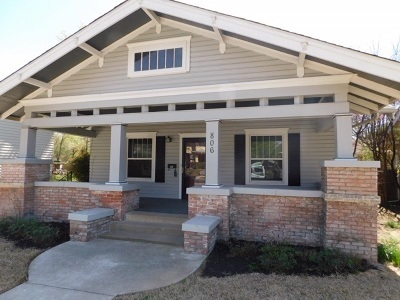 Come be a part of downtown Ardmore enjoy your new large front Porch... Schedule your showing today!